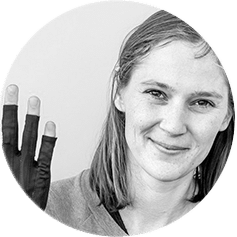 Since 2006 Hannah Perner-Wilson has been crafting, documenting and sharing her work in electronics textiles – a hybrid field of craft and technology. Working in a field (still) without standardized solutions has both caused and allowed her to question conventions and cultures surrounding technology production and use. With her contributions to this field she aims to expand our ways of understanding, creating and using technology. Breaking with the image of electronics as industrially produced consumer goods, presenting them instead as an expressive medium, a cultural practice, something to take care of in making and using.